Most of us clean our homes to some extent every week. But how often do we remove everything from a shelf, cabinet, or closet, and clean every surface thoroughly? Spring cleaning is a great way to invigorate your home with fresh energy. At this time of year I want to open all the windows and let the air circulate before I start to dig into the intense housework. I try to go room by room to reduce overwhelm and stay on point. Sometimes, however, breaking it down into activity specific tasks is easier. For example, window washing, carpet cleaning, or changing smoke detector batteries is best done all in one sweep. Sorting and clearing out clutter for donating or holding a yard sale is probably best accomplished room by room. Whichever way you decide to tackle Spring Cleaning, I suggest constructing a check-list to keep track of your progress, especially since the project can take several days or weekends to complete. In a world awash in health damaging chemicals, I strive to clean my house with solutions that are as natural as possible. For example, I routinely use white vinegar and water to clean my ceramic tile floors. I’ve been doing this so long that I have come to associate the smell of vinegar with cleanliness. My rule of thumb is to ask myself if I am okay having this substance go down the drain and into the water supply? If I’m not sure if the cleaning substance can be adequately removed from the water supply, then I don’t use it. Obviously, cleansers with warnings and ingredients I can’t pronounce or don’t recognize fall into this category. Highly sensitive individuals need to be particularly cautious about ingredients in their cleaning supplies. Combine all ingredients into a spray bottle. Shake well to mix and spray. Use a squeegee, some newspaper, or lint free rag to wipe the surface dry. Do not use on or around natural stone surfaces, as the vinegar can etch the stone. I’ve also seen a recipe that includes 1 tbsp of cornstarch instead of the dishwashing soap. Since I don’t use cornstarch for anything else, I prefer this recipe. 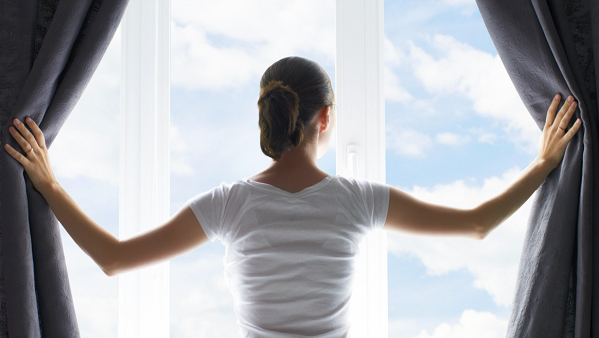 A helpful tip when cleaning windows is to wipe from side to side on the outside and from top to bottom on the inside. That way you know which side a streak is on. 10 drops essential oil of your choice. For anti-bacterial and anti-viral properties, choose oregano, thyme, cinnamon, or tea tree oil. Combine all ingredients into a spray bottle and shake well before using. I prefer to use bar rags instead of paper towels.